I don't want FOP gdamnit! I'm a Dapper Dan man! 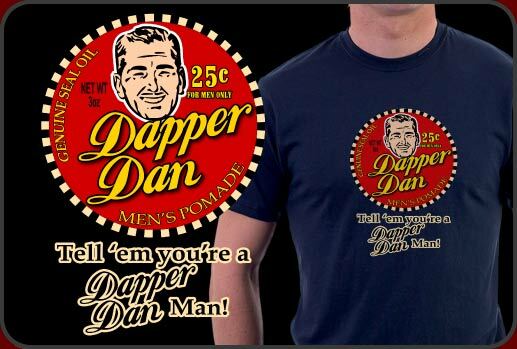 Very cool Dapper Dan Shirt fashioned into an old-time advertisement parody. As it's easy to see from the movie O' Brother Where Art Thou, there is no substitute for the pleasing aroma of Dapper Dan Men's Pomade. This Dapper Dan Shirt is a hilarious throw back to the hit movie O' Brother Where Art Thou starring George Clooney and Holly Hunter. Our Dapper Dan Shirt prints beautifully on either light or dark color shirts and there are tons of name brand styles you can choose from!